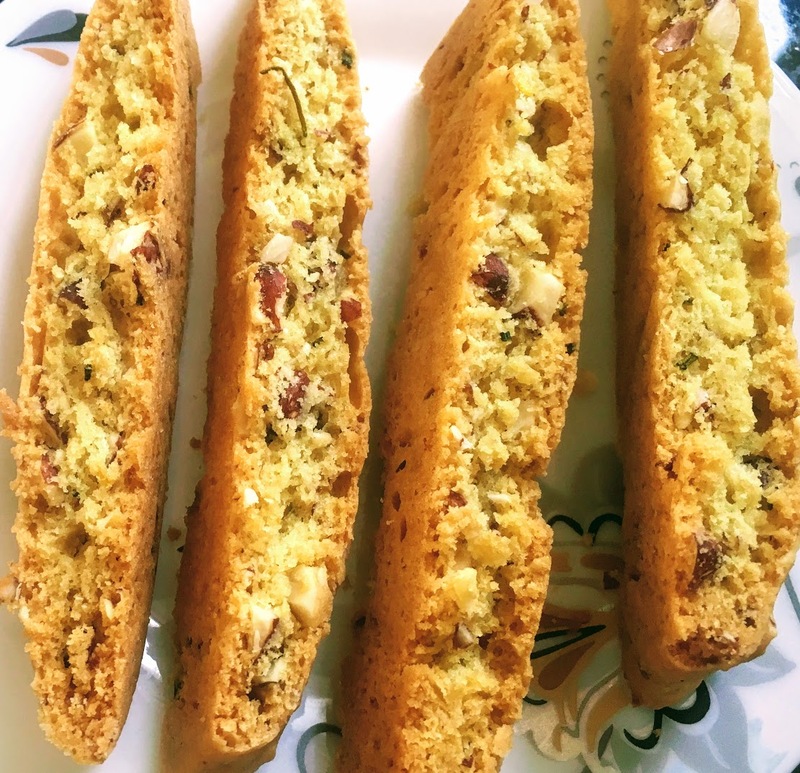 After reading about a pine nut and rosemary tart in The Craft of Baking, a cookbook by pastry chef Karen DeMasco, I thought about incorporating rosemary into a new recipe for biscotti, twice-baked cookies with origins in Italy. Almonds, a classic biscotti ingredient, and rosemary, an herb often used in Italian cooking, can be roasted together as a fragrant snack. So I figured the ingredients would work well together in a sweet and savory biscotti, complemented by almond extract and citrus zest; either lemon or orange is delicious. With the addition of butter, these are softer in the middle than traditional biscotti, but still have a delightfully crunchy exterior. Preheat oven to 350°F and line a baking tray with parchment paper. In a small bowl, combine flour, salt, and baking soda. Set aside. In a large bowl, cream together butter, sugar, rosemary, and lemon or orange zest until light and fluffy, about one minute. Stir in eggs and almond extract until smooth and well-combined. Add flour mixture to butter mixture, and stir until just incorporated. Add almonds. Divide dough in half. Form each half into a rectangle (about 10 inches long and 3 inches wide) on the prepared baking tray, a few inches apart. Lightly flour the dough if it is too sticky to shape. Bake for around 25-30 minutes, until golden brown and just firm to the touch. Let cool for a few minutes, and then cut into equal-sized slices (around 1 inch wide.) Place biscotti cut side down and bake for another 10-15 minutes, or until biscotti are crisp around the edges and golden brown. Once cool, store at room temperature in an airtight container. My mom loves biscotti, so I’ll have to make these for her! Thanks for sharing this recipe! Hello. I will have to try this recipe.